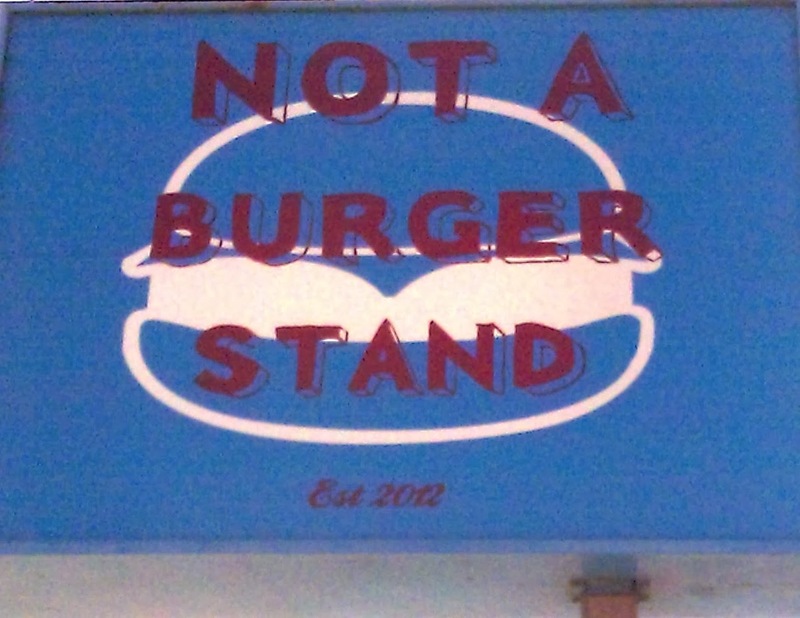 As a burger reviewer, upon reading the name "Not A Burger Stand," I was ethically obligated/compelled to see if they had a burger on the menu. There was burger, so off to Burbank on a Saturday afternoon with Happy Meal. Parking was available at no charge in the attached lot of the small 13 tables (inside and out) establishment. We ordered a couple of the 7 Oz Beef Burgers, a side of fries, an order of chili cheese fries, and a soda. This came to about $25. Our order arrived at our table in about 15 minutes. The chili cheese fries arrived first, and that was appropriate, since they were an appetizer. The Beef: This was plain old Chuck. I noted the 10-pound, clear ,plastic tube of ground beef on the counter of the cramped kitchen, so I did not kid myself about stellar quality. 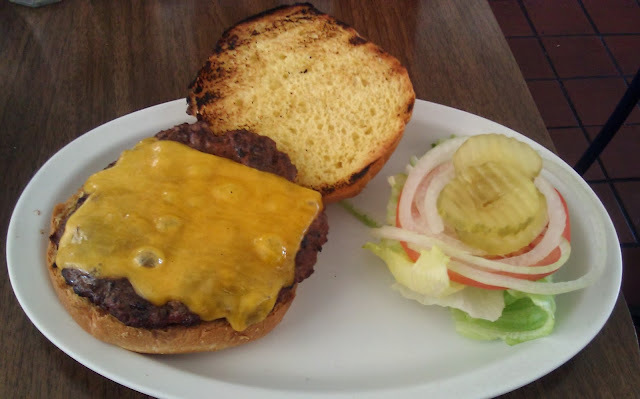 The fat content was 30%, so we ordered our burgers Med-Well to render off some of the copious fat--we wanted to live to eat on another day. 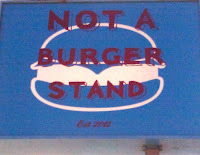 The beef in the cheeseburger at Not A Burger Stand was unremarkable in terms of both texture and flavor. The flavor was beefy, and that was it. The burger was not juicy. There were no notes of iron, funk, etc. This was a very basic burger. The Seasoning: The exterior of the burger patty was liberally salted, and this maximized the beefiness of the patty. The Sear: Not A Burger Stand grilled the burgers on cast iron grates, and these imparted reasonable grill marks on the patty. 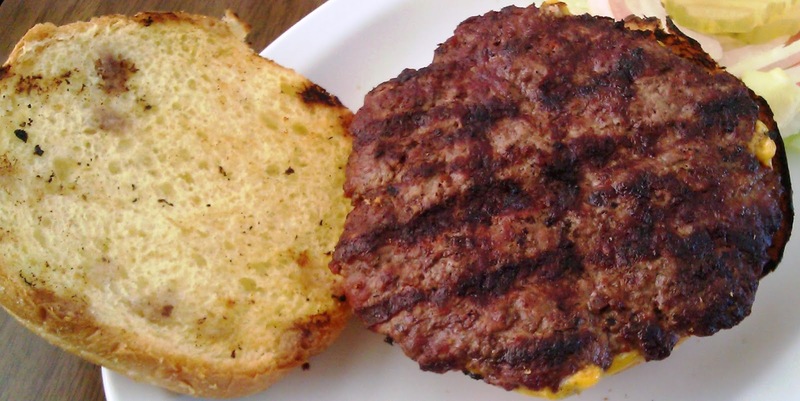 The hash marks on the patty demonstrated that the patty was turned too many times, and this accounted for the relative dryness of the bite. The sear, while not crisp, did carry a bit of char, and this gave the burger a backyard BBQ flavor. It was fine. The Preparation: The burger at Not A Burger Stand was prepared competently but from the most average of ingredients. The result was an average cheeseburger. The Cheese: Meh. This was a mild Cheddar. While the Cheddar carried a hint of iron, the slice was too thin to truly create an impact in terms of flavor, texture, or moisture. The cheese was properly melted. The Bun: Not A Burger Stand employed an eggy and savory brioche. The brioche was not sweet, buttery, or light. It was a glorified Kaiser roll. The bun was reasonably fresh. It was semi-toasted on the grill, but this imparted no crispness to the bite. The Meat To Bun Ratio: This was fine, but I did eat the second half of the burger without the bun, since savory on savory was a waste of calories. The Toppings: The tomato slice was hard, bland, and under-ripe. The Iceberg lettuce was just fine. 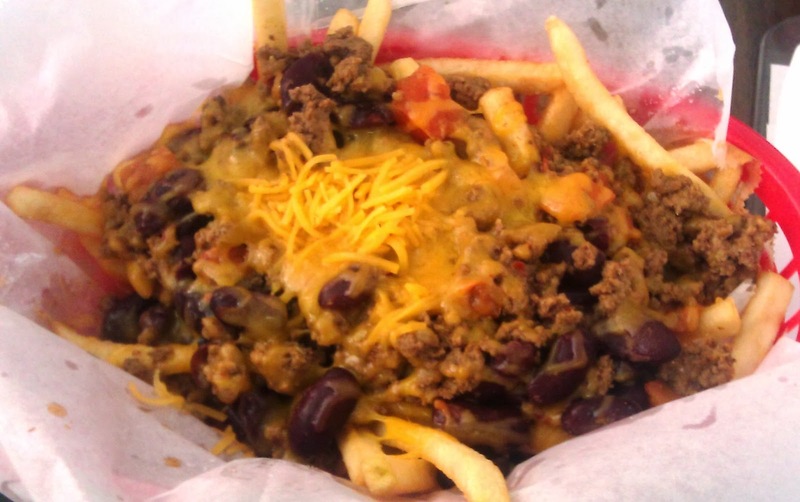 The Chili Cheese Fries: Not A Burger Stand's idea of chili was raw, diced tomato mixed with lightly salted ground beef nuggets, some unseasoned beans from a can, and a bit of cheese. There was no trace of chili powder, heat, or the creaminess that one associates with chili fries. The result was fries made lank from the beef juice and rendered bland. This side was an absolute flop. 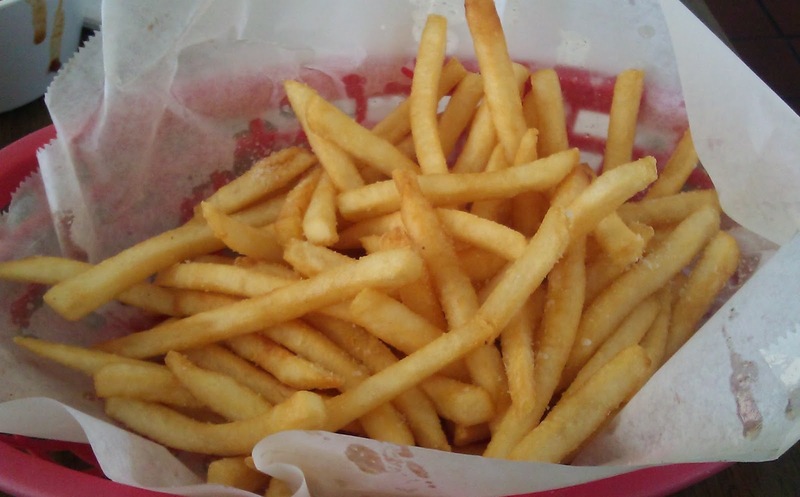 The Fries: The fries were perfectly fine. Food service bagged, frozen, peel-off, par-cooked, shoestring fries. The fries were crisp and properly seasoned. The fries were the best part of the meal, and that is generally a bad sign. The Value: $5.75 for a 7-ounce burger would have been OK, but 30% of that 7 ounces was rendered off in the cooking process. $25 for a lackluster meal dragged the value down to an average rating. Not A Burger Stand lived up to its name. In fairness, nothing coming out of the kitchen looked better than average.